It is not always easy to be a vegan in Málaga, but slowly there are more and more possibilities to live ecologically and / or buy locally. Recently more and more restaurants have been offering vegan food and there are organic grocery stores to be found. And we now even have the first vegan store for clothing, shoes and accessories. Here comes my personal list of vegan tips for Málaga which I will update continuously. Please click on the names of the restaurants and places to locate it on Google Maps for more information about opening-hours and menu. Apart from the old vegetarian / vegan restaurants, there are now more and more places that offer vegan options. With a small walk through the city center, I introduce you to my favorite restaurants and a few organic shops. In the hip SOHO district between Alameda and the port you will find this bistro & ecological shop with a couple of tables outside. I like the “Daily Menu” which is made with loads of love and country themes during the week. My favourite is the Indian-Day, of course. No worries, not all the food is raw but definitely ecological! On the other side of the Alameda is the central market of Malaga which is open every day from 8 am to 2 pm, except Sundays. There are also organic fruit and vegetable stands with a small selection of other foods. The market is the best way to see which fruit and vegetables are currently in season. Not far from the main market, this cafe is located at a newly designed square in the historic old town. Here you can find typical Spanish dishes also in a vegan version on the menu. I have eaten the Spanish paprika sausage “chorizo” in the vegan form with potato chips and the hummus and can recommend both. Creative interior design with attached bike shop and terrace. Across the corner of the square is the first and only vegan shop for clothing, shoes and accessories. The labels are hand-picked, while respecting sustainability and the products are ecological, fair-trade and of course vegan. The vegetarian restaurant with vegan options is a little hidden in a side street behind the Carmen Thyssen Museum. The restaurant is best for the winter or for those looking for shade, since you can only sit inside. Here Mediterranean and international cuisine can be eaten as a daily menu or a la carte. And there is of course hummus! If you want to buy sustainable, ecological and whole-grain, I recommend a shop that sells good produce loose or in bulk, Luz & Tierra on the Calle Carreteria. Here, there are fruit, vegetables, cereals, nuts, dried fruits, miso, tamari, herbs and loose tea. The grain is even ground on the spot as desired. There are books, yoga clothes and cosmetics, all with expert advice. The shop organizes regular cooking classes. Right on Plaza Merced, on the side of the birthplace of Picasso, is the traditional vegetarian restaurant with many ecological and vegan options. A large selection of Spanish and Italian dishes, as well as a lunch menu with a view of the hustle and bustle of the square. Particularly recommendable here is the hummus with red beetroot, which is served with chicory and the Seitan with lemon and garlic as you can see on the photo. Yummy! 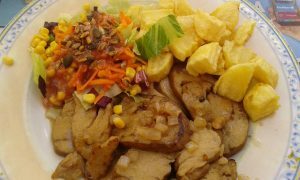 Not far from the Plaza Merced, the Pic Nic Dreams Hostel offers a wide range of vegan food on their menu. The place is cosy inside and has some tables and chairs on the street as well. The “Daily-Menu” sounds promising and the cakes are just amazing. Last time they had Oreo, Coco and Cheesecake to offer. The coffee comes with soy- or almond-milk as you wish. Already an institution is this vegetarian restaurant next to the roman theatre in the City Center. Now the menu shows easily which food is completely vegan and you can´t go wrong with the “Vegan Variation” which consists of minimum five different dishes with Spanish and Moroccan influence. I had a vegan paella, a Seitan-Stick, Soy-Meat-Balls with tomato sauce, red cabbage with raisins, cornballs and a mushroom-croquette served with green salad. 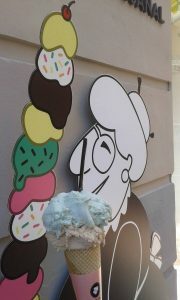 What would Málaga be without icecream! If you walk through the town in the summer one does not pass by ice-cream and not only the tourists love the cool sweetness in the heat. The Spanish ice cream parlors usually offer only lemon as a sorbet or you can drink a granizado, lemon juice with sugar on crushed ice. But now we already have options, Nonna at the corner of Plaza de la Merced and Calle Granada and Amorino further down the street near the Plaza de la Constitucion. Here, the vegan ice-cream lover heart beats faster: creamy pistachio and chocolate ice cream as well as various fruit sorbets. 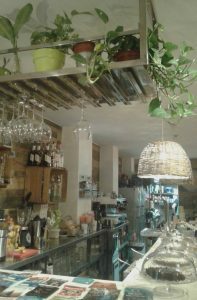 For vegan options on Málaga´s East-Side please check my page for Best Restaurants for Vegans in El Palo & Pedregalego.